Human error appears to have caused a partial shutdown last Friday at the South Texas Project, one of the state’s two nuclear plants. Last week, prices spiked in the wholesale electricity market. On Monday the 16th, wholesale electricity, which had been selling for less than $30 per megawatt-hour spiked to more than $2,000. That’s an increase of more than 7,000 percent. Prices also spiked several times to the $1,000 level. A price spike of $2,200 is especially startling, given that the regulatory cap is set at $2,250. That is, the wholesale prices legally could not have gone much higher. At the same time, according to the Electric Reliabiilty Council of Texas (ERCOT), who manages the Texas electricity grid, a new record for statewide power use was set. Then, to top off the week, Unit 1 of the South Texas Project apparently tripped off (also known in the industry as a SCRAM – an acronym for safety control rod axe man but which is essentially an emergency shutdown of a nuclear reactor). The event, first reported in a trade journal SNL Power Daily, was apparently caused by human error. 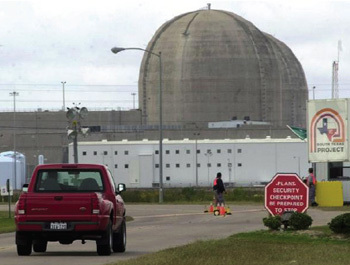 “The NRC said in its Aug. 23 event report that the unit experienced an automatic reactor trip that was caused by an inadvertent turbine signal initiated during testing,” reported SNL’s Jay Hodgkins, citing the U.S. Nuclear Regulatory Commission. The publication reported that power was restored by Monday. It’s unclear whether the outage contributed to the price spikes, although that seems likely. I guess I’ll take a contribution to a price spike over a meltdown any day, but still kind of scarey!